Crystal clear dots or lines that do not yellow and come in a variety of sizes for every craft need. Easy to use: press the object to the Zot, peel off the liner and place it to your project. You never have to touch the adhesive. 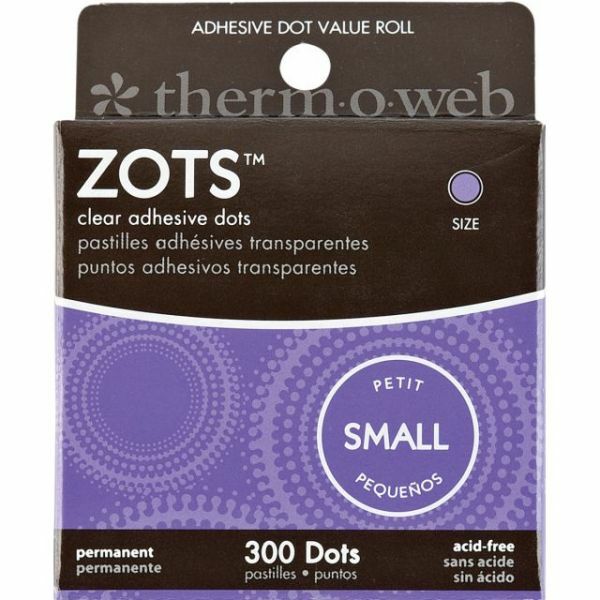 Package contains three hundred 3/16" clear adhesive dots. 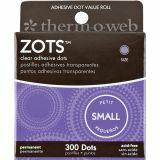 Therm-O-Web Zots Small Clear Adhesive Dots - Zots are available in a variety of permanent sizes (3/16x1/64in (300), 3/8x1/64in (300), 1/2x1/64in (300), 1/2x1/16in (250), 1/2x1/8in (200), ), 3/8x1/64in (200) repositionable and all are acid free, clear double-sided, high-tack and form an instant bond with photos, paper, acetate, plastic, glass, chipboard, fabric, yarn, thread, ribbon, wood and much more for scrapbooking, card making, paper crafting, home decor and more. All Zots products are acid-free, archival and conform to ASTM D4236. Made in USA.